Overnight on the 8th December 2016 the first of South West Trains new class 707 'Desiro City' trains transited through the Channel Tunnel to arrive on UK soils. 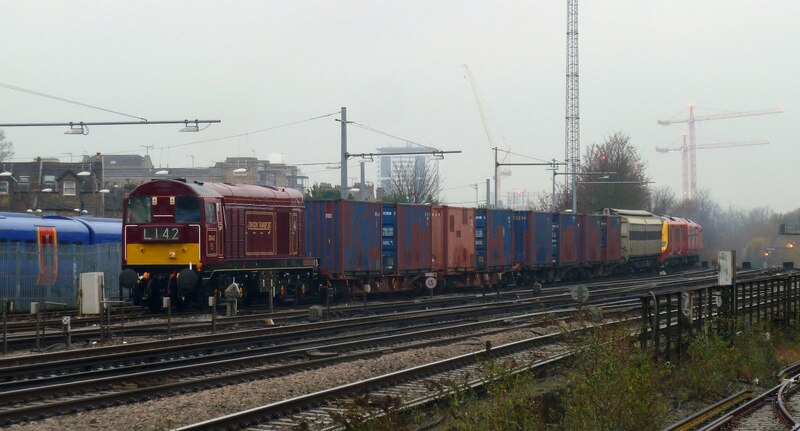 The move of the single 5 car unit was carried out by Rail Operations Group's 37800 and 37884. Once on SWT territory the unit was taken to Clapham yard to await moving into the carriage sheds on the morning of Saturday 10th December, 20142 was provided for shunting. The 30x 5 car class 707's are similar to the class 700's which are currently being delivered to Thameslink. While destined for pure DC operation the first class 707's will be fitted with pantographs for AC testing as part of the type approval process. They are due to enter passenger traffic on suburban routes with SWT in spring 2017. Not one of the greatest photographs to ever appear on this site, but one that does have significance. The first class 707 for South West Trains is shortly to be shunted from 29 road in Clapham Yard to the carriage shed for initial training and acceptance works. 29 further units will follow 707001 through the tunnel to South Western metals.